Before you can project from your wireless network, you must select the network settings for the projector using its menu system. 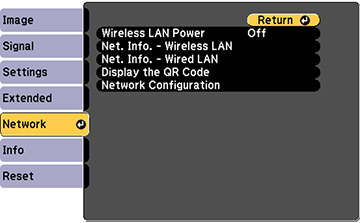 Select On as the Wireless LAN Power setting and press Esc. 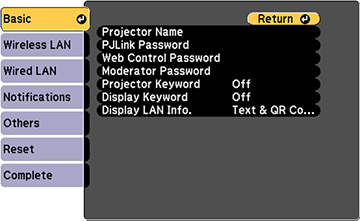 Projector Keyword lets you turn on a security password to prevent access to the projector by anyone not in the room with it. You must enter a displayed, randomized keyword from a computer using the Epson iProjection (Windows/Mac) software or the Epson iProjection app to access the projector. 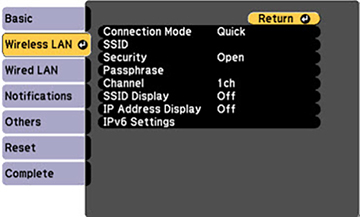 Select the settings on the Wireless LAN menu as necessary for your network. Note: Some items may be unavailable if Quick or Advanced connection mode is selected. After you complete the wireless settings for your projector, you need to select the wireless network on your computer, or iOS or Android device.